I would say that getting such a wonderful price for the beddings is really a good bargain. The beddings look quite beautiful as well. I should get one of this mattress/bedding for my dad since he always complained of his back pain whenever he wake up from bed every morning. I really like the fabric of this bed sheet. And also the colors are great. I would love to have this in my room. The color of the fabric looks nice. The price is also very affordable . The stripes on the other side and the parsley design looks pretty cool as well. I love discounts! Great that you guys made discounts in some of your products especially bedding set. 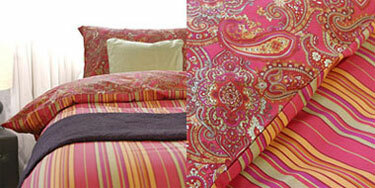 Its a very beautiful bedding set. I guess it will be a very pretty layout for a slumber party specially if the guests are girls. And the discount will surely make the ladies go crazy for this. What a nice offer,great discounts.I will buy 3 sets to be given away to my sister in laws so that all of us have these colorful cover and pillow case. People who suffer from allergies can find it hard to get sleep. They often suffer frequent bouts of sneezing, runny nose, and itching that can keep them up all night long. To make it worst, the bed which is supposed to be the most restful place in the house can contain a lot of allergens that can trigger allergic reactions. Some time before, I really needed to buy a building for my organization but I did not earn enough money and couldn't purchase anything. Thank God my friend adviced to get the loan at trustworthy creditors. Therefore, I did so and was satisfied with my short term loan. A bed sheet is a piece of cloth used to cover a mattress. It is this sheet that one typically lies on. It makes us comfortable when we sleep.